ConceptDraw MINDMAP extended with Presentation Exchange solution allows you to create a traditional PowerPoint Presentation from your mind maps. There are two different variants when exporting to PowerPoint - one places editable text into the template of your choice, the other places the pieces of the map that you want to show into the slides. Pic. 1. Export of an outline from ConceptDraw MINDMAP to MS PowerPoint. Pic. 2. 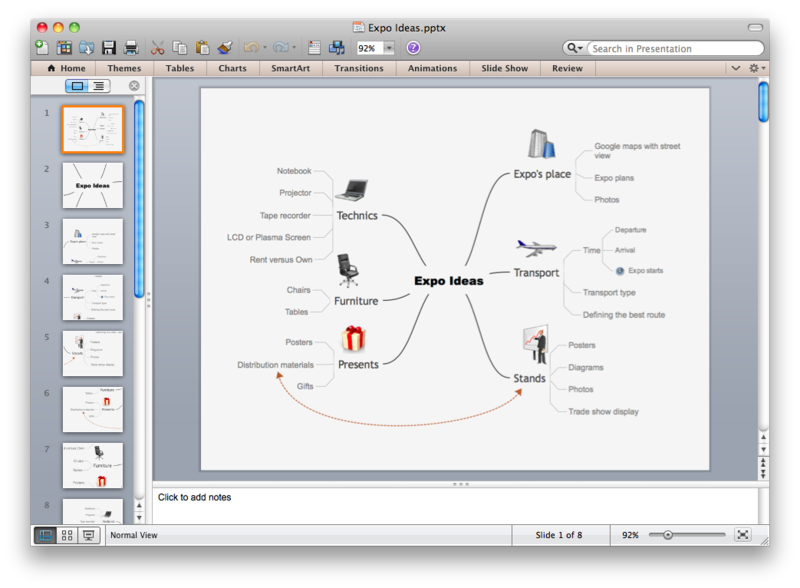 MS PowerPoint presentation exported from ConceptDraw MINDMAP document. Using ConceptDraw MINDMAP with Presentation Exchange solution installed you can create an effective PowerPoint presentation within a seconds with no difficulties. Over 1400 vector stencils for port terminal, shipping and receiving buildings of every size and type, with modifications available. ConceptDraw DIAGRAM v12 diagramming and vector drawing software offers the Pie Charts solution from the Graphs and Charts area of ConceptDraw Solution Park for quick and easy drawing the Pie Chart of any complexity. ConceptDraw DIAGRAM v12 software is the best Mac software for drawing workflow diagrams. Its rich set of samples and templates, and specific features to draw diagrams faster make this software as comfortable as possible for drawing workflow diagrams. Use the ConceptDraw DIAGRAM v12 professional Mac OS X software for drawing workflow diagram. The Workflow Diagrams solution with its libraries and templates set make the possibility to identify resources that are required for work goal implementation. The process flow diagram identify flow which occurs as network of process dependencies, organizational decisions and interactions between departments. Usually workflow diagrams show business participants actions that carry product or service to the final destination, the consumer. You want create a professional room plan quick and easy? ConceptDraw DIAGRAM v12 diagramming and vector drawing software will help you. It’s very simple and convenient design the room plans with Floor Plans Solution from the Building Plans area of ConceptDraw Solution Park. ConceptDraw DIAGRAM v12 has extensive export capabilities which allow you to export your drawing to MS PowerPoint file formats. So, you can create effective presentations right from your ConceptDraw DIAGRAM v12 documents.